The general way to approach Son Of Zorn seems to be to come at it as critique or satire of “toxic masculinity.” Zorn himself would be the epitome of toxic masculinity come to life (albeit as a highly exaggerated warrior out of a Hanna-Barbera superhero show), who moves from his hyper-masculine, war-mongering world into a meek, laid-back suburbia that has no place for people like him. “Defender Of Teen Love” has numerous examples of how uncomfortable or dangerous unchecked “devil may care” masculinity can be. If that’s what the show is going for though, so far it’s been mostly a failure. I’m more interested in how the show develops its interplay between the animated insanity of Zorn and his perspectives, and the regular world of Edie, Alan, and the rest of the live action cast. Yet on that point, the show has been mostly a failure too. It’s the little things, really, like the weird slugs that crawl on Edie and Craig. There’s no context to them. They’re just creepy things that bother the two of them, to the point that Craig throws one into the garbage disposal. We don’t even learn if they’re dangerous or not, which would have opened up Zorn’s world (and Edie’s and Craig’s insight to that world) just a little bit. But it’s also the bigger things, like the Stone of Sight—a magical device that allows the user to observe a person from a distance. Zorn mentions that it would be disastrous in the hands of evil. But there’s no other information about it: no history, no origin, no unique connection to his past or his world of Zephyria. It’s just a thing that Zorn happens to have in the assortment of boxes of his old junk that Edie packed away in her garage. Son Of Zorn doesn’t realize how much more interesting Zorn is in terms of his warrior life over the generic, bland sitcom life around him, nor does it realize how Zorn’s over-the-top lifestyle could really kickstart or subvert those sitcom beats. The Stone of Sight is used in this case to basically stalk a girl that Alan likes, and it’s on this major plot point that the show fails both in its critique of toxic masculinity and in its exploration of Zorn’s perspective. When Alan discovers that his father has been magically “observing” Nancy, the girl he likes, he rightly expresses his horror—at first. Then he grows accustomed to the Stone’s insights, dressing and acting on the info it finds to impress her. This is mostly played for laughs, but very little of it is funny, mainly because it’s cliché as all hell. You have a cartoon character using a cartoon device, but it only leads to the same kind of semi-awkward cringe gags seen in a million other shows. It also doesn’t help that, in effect, the Stone of Sight (and the regular stalking Zorn implements when the Stone is locked up) works out well for both Zorn and Alan. The episode ends on seemingly “tragic” beats—Alan learns that Nancy has a boyfriend, Zorn recognizes Edie’s and Greg’s real love for each other—but there’s no real consequences for their actions. The information they learn has been gathered by illegal (or, should-be illegal) behavior, but it’s all taken as a lark. The Stone of Sight plot, instead, is used in a more thematic approach in relation to the idea of letting go and moving on, which completely falls flat. The main issue is that Zorn was already gone for three-plus years. That he comes back, pines after Edie, and then acknowledges she has moved on (and he needs to move on) completely lacks any emotional weight. His desire to re-connect with Edie is based less in his longing for her, and more in his jealousy of Craig and his self-serving need to re-claim Edie. “Defender Of Teen Love” seems to miss that point, which makes all discussion of toxic masculinity moot. In terms of the interplay I mentioned earlier: We learn that Edie has a tattoo of Zorn’s name, and that she didn’t get it removed. That’s nice, but that’s all we learn. With no real insight into how Edie really feels about Zorn or her past in her life in Zephyria, it feels almost fake. Zorn references all the things he and Edie used to do, but she constantly dismisses it. From a viewer perspective, that’s a buzzkill. If Son Of Zorn wants to tackle toxic masculinity, it needs to really hit harder on the awfulness of Zorn’s use of the Stone of Sight. Zorn constantly proclaims the Stone is dangerous in the hands of evil, and Edie does call out that Zorn is basically using the Stone for evil, but it comes off more like an annoyance, not the serious violation of privacy that it really is. If Son Of Zorn wants to work more with the “interplay” concept, the show could have, theoretically, used the Stone for any other reason outside of stalking women, or allow Edie to open up about her history. It does neither, which leaves the whole live-action/animation concept as a gimmick. You don’t need a magical talisman to see through that. During the end credits, one of Zorn’s maces hatches and gives birth to some kind of mutant thing. I’m 100 percent more interested in that than mostly everything this episode offered. 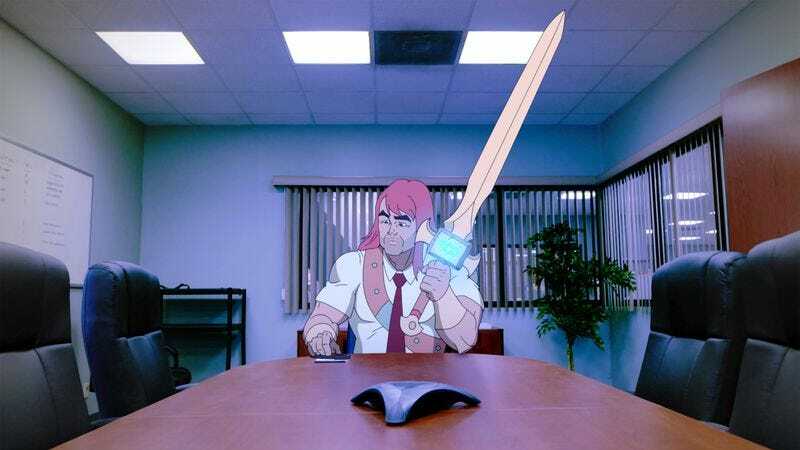 The workplace continues to be the best thing about Son Of Zorn. Artemis Pebdani is still great as Zorn’s boss, and the silly nonsensical talk between Todd and Zorn was pretty funny. I’m probably going to talk about this more next week, but the challenges in filming the live-action characters in relation to Zorn is really glaring. It feels like a lot of actors are missing their marks, or the animators aren’t adjusting Zorn enough to connect eyeline matches or camera angles. One of the reasons Pebdani is so good is because she consistently nails it. There’s a reason why she’s seen in the same shot as Zorn more often than the other actors.